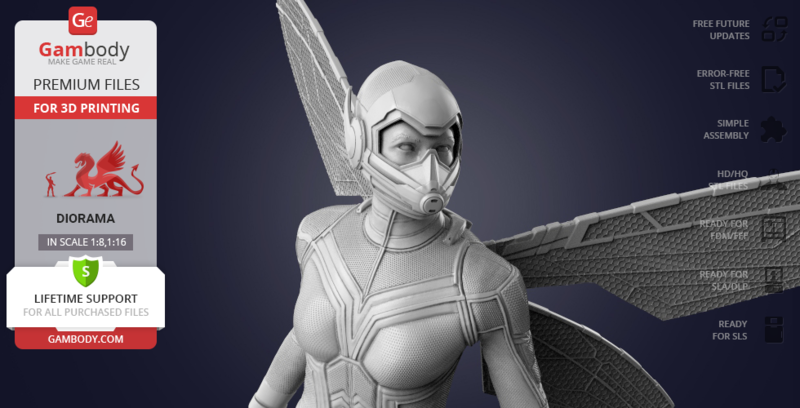 Initially both Ant-Man and Wasp 3D Printing Figurines had the version of the head where eyes are covered by the helmet’s visor. But later at our customer’s request the new version has been introduced for both Ant-Man and Wasp Figurines where the eyes can been seen and may be covered with assembly glasses: https://www.gambody.com/image/551/ce68.png, https://www.gambody.com/image/556/9e0c.png. At the moment bothe versions of the head are available for downloading and the updated version where eyes and glasses are introduced you can find on both models’ pages tab ‘Source Files’ version FFF/FDM 1.0 at the bottom of the STL files’ list: https://monosnap.com/file/BYLgh368Vwyz5v9ZWz1NOzXq6agQFG, https://monosnap.com/file/gUrvfoTbIoRCLUENy1ruJk3IFDxC2L.